In what is not a terribly big surprise considering that they started shipping at the beginning of the week, free iPhone 4 bumpers have begun arriving into the hands of customers. As with the first wave of shipping notices, the arrivals appear to be limited to the UK for the time being, although customers in other countries who have received shipping notices can expect theirs to quickly follow. 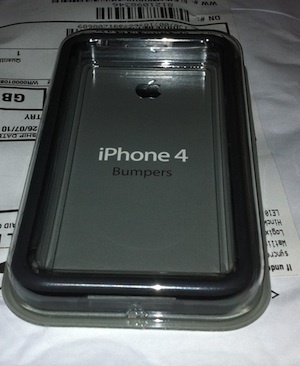 Recipients report that the bumpers come in the standard Apple packaging for the product. And while customers who ordered bumpers are beginning to see theirs arrive, those who opted for third-party cases through the free case program have still seen no sign of movement on their orders, with shipping estimates pushing out well beyond a month for many customers. Those customers should keep their eyes peeled, however, as orders for Apple bumpers similarly showed lengthy initial shipping estimates before suddenly beginning to ship earlier this week.